By the time the Legislature gavels in on Monday morning, we will have delayed the work of the people by almost four weeks. Until a permanent speaker is elected, the Uniform Rules preclude the House from accomplishing anything of substance, including important functions such as the introduction of bills – including the governor’s operating, capital and mental health budgets – consideration of Senate bills and vetting of the governor’s appointees. Every day that we sit here without a fully functional government, we waste valuable dollars that we cannot get back. In a time of budget deficits, this is even more painful. We don’t have months, weeks or even days to sort this out. The notion of power sharing that has been explored isn’t a realistic option because it doesn’t offer a timely outcome, nor has it been able to satisfy the requirements of the Constitution, the Alaska statutes and the Uniform Rules. But even if it had checked those boxes, Alaskans did not send us to Juneau to remake the house procedurally. They sent us here to address our budget deficit, community safety and the Permanent Fund dividend, among other important issues facing our state. Those trains are coming down the track at full speed. The governor is making appointments and preparing his budget. The State Senate is deliberating on bills to improve public safety, ensure our kids are properly educated and keep our economy moving forward. The State House is stuck in limbo. Alaskans are very upset, and they have every right to be. I have genuine personal respect for every member of this chamber. All of us care deeply for this state and the institution of the House. A number of members have participated in what I believe are good-faith conversations over the past four weeks about how we can bring everyone to the table and get to work. But unfortunately, these conversations have been fruitless, and this unnecessary delay has caused us to neglect our body’s sole responsibility: to govern. 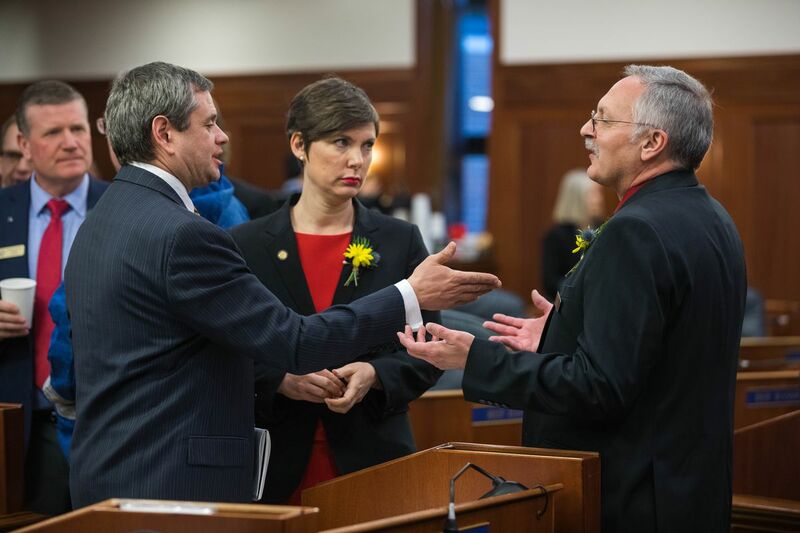 In the interest of ending this deadlock in a timely fashion, we have invited a number of our like-minded colleagues across the aisle to join our caucus, as we often have over the years, by extending offers of membership and even assignments of significant power and position within the Republican-led majority the voters sent to Juneau. But unlike in previous years, these offers have languished on the table for several weeks, with little response and no clear end in sight. To this point, I’ve declined to name names or disclose information regarding invitations that have been made to members, out of respect for my colleagues and the negotiating process. But politics is a team sport and right now, there are a whole lot of individuals who have chosen to try and play by themselves. Whether we like it or not, the will of the people was made abundantly clear on Nov. 6. Let’s put this majority together and get to work. Rep. Dave Talerico, R-Healy, represents House District 6 in the Alaska House of Representatives, and is the leader of the House Republican Caucus. The views expressed here are the writer’s and are not necessarily endorsed by the Anchorage Daily News, which welcomes a broad range of viewpoints. To submit a piece for consideration, email commentary(at)adn.com. Send submissions shorter than 200 words to letters@adn.com or click here to submit via any web browser. Read our full guidelines for letters and commentaries here.